Lowell Green, CFRA’s sharp-tongued radio host who captivated and exasperated Ottawa audiences for more than 50 years, announced his retirement early Monday. Starting out as a news and farm reporter in 1960, Green, 79, was best known for his cantankerous exchanges with listeners who called in to speak with him about current events on the popular Lowell Green Show, which began in 1993. While some may have felt Green’s style was too confrontational, his fans loved his no-nonsense style and considered him a champion of common sense. Loved or hated, Green’s on-air conversations were always water-cooler fodder across Ottawa. Reaction to Green’s retirement was swift. A large void will be left behind with the departure of @LowellGreen from @CFRAOttawa. Thank you for your years of dedication and passion. Grew up listening to @CFRAOttawa with my Dad. Good luck with your next adventure @LowellGreen, Canadian radio won't be the same without you! Green told listeners his decision to step down was entirely his own, according to a statement on CFRA’s website. In an interview four years ago with Ottawa Magazine, Green was asked if he still felt he was relevant. Green plans to make regular appearances on CFRA through his retirement. Green’s retirement marks yet another significant change in the capital’s radio landscape. In November CFRA said goodbye to Steve Madely, who also retired. And, in a controversial move, popular hosts Shelley McLean and Rick Gibbons, along with several others, were let go the same month. 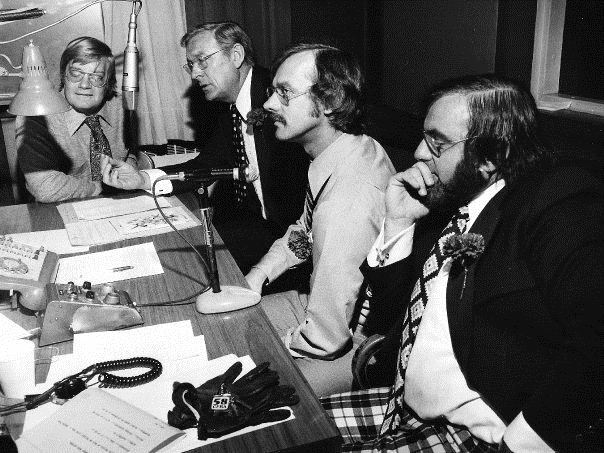 An archival photo from CFRA’s website shows Lowell Green at the mic with Terry Kielty, Joel Thompson and Ken Grant.